This week the Cal Poly MultiCultural Center celebrated the opening of their new center in the University Union. As part of the celebration, we are highlighting the MultiCultural Center collection in the University Archives. The MultiCultural Center (MCC) was opened in 1982, the first of its kind in the CSU system. The center was the idea of Cal Poly student Salvador Villaseñor (Ag Science, ’83), who observed racism and stereotyping when participating in the Junior Writing Test. Villaseñor, along with the Cal Poly Cultural Advisory Committee and faculty members in the history and education departments, proposed and developed the idea for the MultiCultural Center. Located in the University Union room 103, the MCC offered five program areas: an information-referral desk, a peer-helper program for international students, a cross-cultural research resource center, cultural activity program, and a community outreach program. 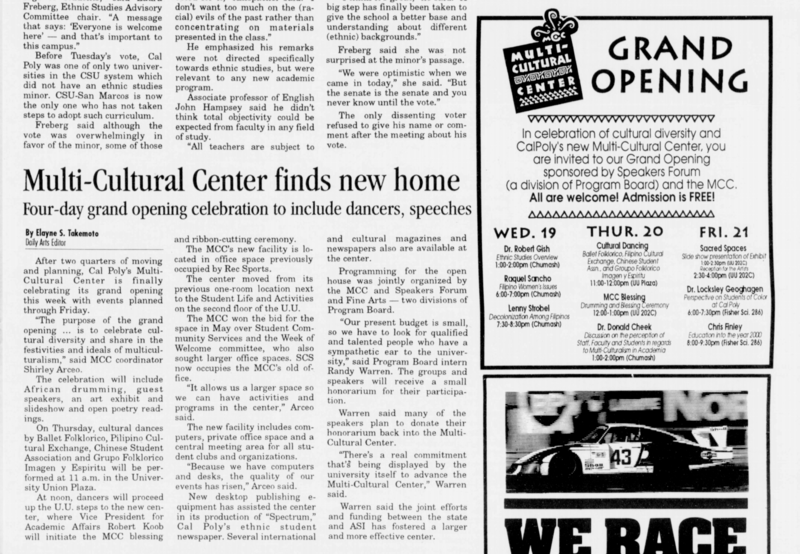 Photos from the opening of the Multicultural Center, January 1982. ITS 82-596, University Archives Photograph Collection, Special Collections and Archives. In 1994 the MultiCultural Center moved from the first floor of the University Union to a new, larger space on the second floor. The Grand Opening took place over several days in January, and included invited guest speakers, dancing by Imagen y Espíritu Ballet Folklórico de Cal Poly and the Chinese Student Association’s Lion Dance team, and an African blessing at the ribbon cutting ceremony. January 19, 1994 issue of the Mustang Daily. Today, the MultiCultural Center provides programs and services that aid in the outreach and retention of under-represented students through advocacy, community-building, and co-curricular programming. The MCC is a welcoming space in the Cal Poly community that embraces diversity and works towards social justice. As part of the Cross Cultural Centers, the MultiCultural Center contributes to the University’s commitment to diversity for a more inclusive and welcoming campus. The MultiCultural Center collection in University Archives spans the years 1984 – 2012. 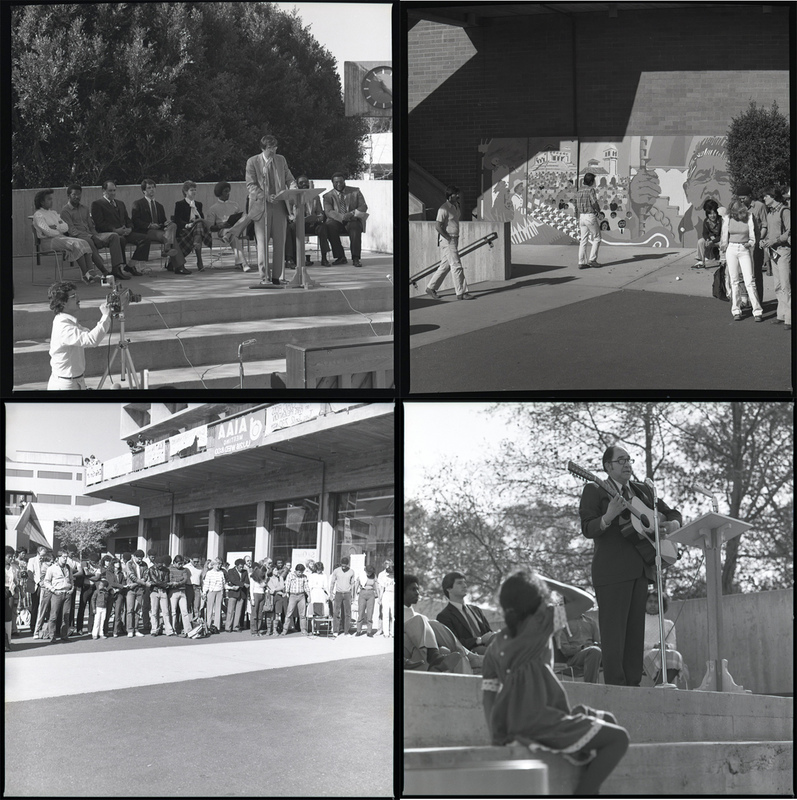 There are photographs related to Martin Luther King Jr. Day events and Black student activities on campus from 1984 – 1996. The photos include images from the African American Student Union, Society of Black Business Students, and the Lantern Festival. 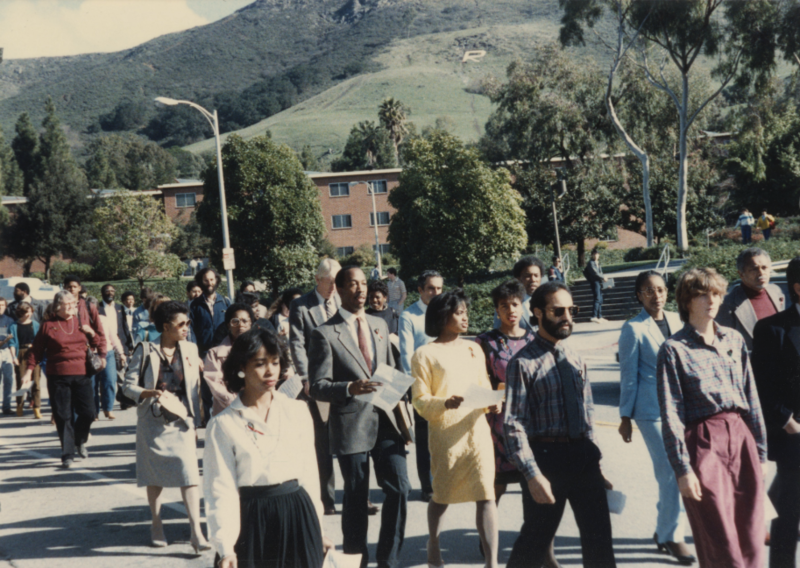 1989 Martin Luther King, Jr. March on the Cal Poly campus. 0063_ua_000007, UA0063, MultiCultural Center, Special Collections and Archives, Cal Poly. The collection also includes 18 VHS videotapes of campus activities and events that were organized by the MultiCultural Center including discussion panels, celebrations, and performances. University Archives recently digitized the VHS tape capturing the opening of the MultiCultural Center in 1994. 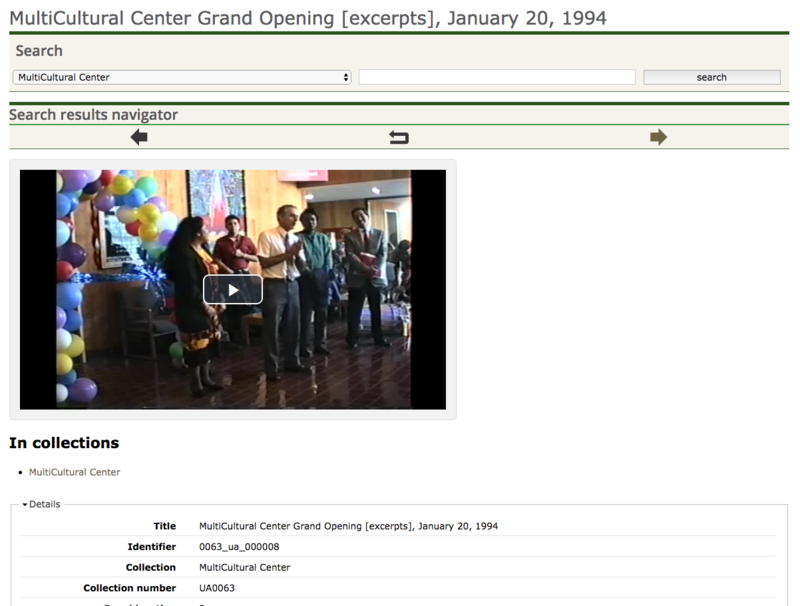 Special Collections and Archives digitized the VHS tape of the opening ceremony of the MultiCultural Center in 1994. See the full video here. The MultiCultural Center has had an active publishing component for decades. MCC publication from the 1990s and 2000s are accessible in the University Archives, including the MCC newspaper Spectrum, the MCC magazine Culture Lines (later renamed Cultures), and the MCC newsletter Roots. Other collections in the University Archives highlight the activities of the MCC, including photos in the University Archives Photograph Collection, records in the Office of the President Warren Baker collection, and coverage of MCC events in the student newspaper. Connect to the Multicultural Center on their website. Learn more about UA0063 MultiCultural Center collection. See materials from the MultiCultural Center collections digitized at the library’s Online Collections. Read more on cal poly history, Multicultural Center, and university archives.